Samsung SEW-2001W Wireless Baby Audio Monitor. Sound Alert - when out of wireless range or detect baby sound. Latest DECT Digital Wireless Technology for full and clear sound quality. Baby Monitor 1 EA (Baby Monitor only operates with power adapter connected). Missing Mounting Screws, SAMSUNG BRIGHTVIEW Wireless Pan Tilt ZOOM VIDEO BABY MONITOR. 5" Touchscreen LCD. Good condition. Adapters may vary. Box has imperfections. LIGHTLY USED.MAY HAVE A SCRATCH OR TWO BUT GOOD CONDITION AND WORKS FINE. TESTED WITH MONITOR AND IT WORKS FINE. YOU WILL NEED A 5V USB - MICRO POWER ADAPTER & CABLE. I want you to be happy! Samsung SEW-3043WN Wireless Camera / ONLY Camera in Stock!!! Sound Level LEDs | Sleep Mode. Non-visible IR LEDs for Night Vision up to 16ft. Samsung SEW-3020 SafeVIEW Baby Monitoring System. No charger/adapter included but both camera and handheld monitor work. The item/items you're receiving are pictured and you will receive only what is pictured. Shipping for this item is $10.00. Buyer will pay return shipping in all cases as well as initial shipping if nothing is wrong with the item. All items must be paid through PayPal in no later than 5 days. Used- Tested and works. Item has light wear due to general use. Charger is not included. Please view images for more details. •	Payment We only accept Paypal Payments. Please make payment promptly after winning our Auction or Fixed Price listing. Thank you. •	Shipping Our shipping policy is 1-4 business excluding weekends and holidays. •	Return Policies If I have made a mistake in the listing, I am happy to take returns. Restocking fee is applied for items not defective. Please contact me with any issues. TESTED WITH 3057 MONITOR AND IT WORKS FINE. LIGHTLY USED.MAY HAVE A SCRATCH OR TWO BUT GOOD CONDITION AND WORKS FINE. YOU WILL NEED A 5V USB - MICRO POWER ADAPTER & CABLE. I want you to be happy! samsung baby monitor camera. Working good. 1 monitor with 2 cameras. Sold as is. Shipped with USPS Priority Mail. No P.O. Box. It only compatible with SEW-3043WN Baby View Monitor Wireless. SAMSUNG SEW-3036W Wireless Baby Monitor & power cord Only . Condition is Used. Shipped with FedEx SmartPost. Das SEW-3036 sorgt für eine große Übertragung von bis zu 250m. Simple & Secure Digital Wireless Baby Audio Monitor. Sound Alert - when out of wireless range or detect baby sound. Latest DECT Digital Wireless Technology for full and clear sound quality. Baby Monitor 1 EA (Baby Monitor only operates with power adapter connected). The BabyView SEW-3057W monitor system brings parents a simpler and better experience watching over their baby. Use the bright and wide 5” LCD touchscreen monitor to enable the array of features provided, such as the 300° pan, and 110° tilt capabilities, Two-Way Talk, and night vision. Samsung SNH-1010N SmartCam WiFi & Video Baby Monitor. This give you the freedom to monitor your child using your smartphone, tablet, laptop, and/or pc. Share it with your friends and family or make it publc to share it with everyone. S ale Includ es: SAMSUNG WISENET BABY MONITOR VIEW WI FI REMOTE VIEWING TOUCHSCREEN only. Function: This Item Is New, MINOR SCRATCH, DENT IN BOX. SEE ALL PICTURES. DECT 1.9 Ghz digital wireless technology for fuller and clearer sound. - 1 baby audio monitor 2 parent audio monitors, 2 batteries and 3 power adapters. Perfect and complete. - Built in belt clip. SAMSUNG SEW-3053WN. no box or cable. or anything else. just the MONITOR. LIGHTLY USED. 1/4" SCRATCH ON THE SCREEN OTHERWISE IS IN GOOD CONDITION AND WORKS FINE. I want you to be happy! 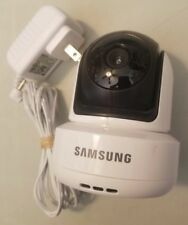 Samsung SEW-3036W BabyVIEW Baby Monitoring System IR Night Vision Zoom 3.5 inch. Condition is Used. Shipped with USPS Priority Mail. SAMSUNG WISENET Babyview Monitor Set. Model #SEW-3057W. Excellent Condition. SAMSUNG WISENET Babyview Monitor Set. Model #SEW-3057W. Excellent Condition. (Ref. #5682. J1244). If there is a problem with your item once you receive it. TESTED WITH 3057 MONITOR AND IT WORKS FINE. LIGHTLY USED.MAY HAVE A SCRATCH OR TWO BUT GOOD CONDITION AND WORKS FINE. SAMSUNG SEA-SE10. I want you to be happy! A good Used Samsung Monitor SEW-3030WN. The SEW-2002W is a wireless audio monitoring kit designed to be an extra set of ears for your baby. The pairing is easy so that a parent unit and a baby unit can be connected just by the push of a button. Samsung SEW-2002W Secured Digital Wireless Baby Audio Monitor with 2 Parent Unit. 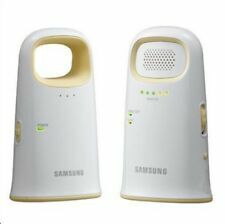 NEW Samsung Simple & Secure Digital Baby Audio Monitor 2 Monitors DECT 1.9 Ghz. Condition is New. Shipped with USPS Priority Mail. Does NOT include baby monitor or manual instructions. Communication technology - Wireless. Display type - no video display.